The word menopause makes most women cringe because they know that every part of their body can be affected or altered during this time. What they don't know is the toll that it can take on their skin. Menopause refers to the end of menstruation and the physical and psychological changes which occur in women as their "female" hormone (estrogen and progesterone) levels decline and menstruation ceases. The skin, which helps to regulate the body's temperature, prevents harmful environmental hazards such as ultraviolet light from damaging our internal organs and helps to produce essential vitamins for our body to use such as Vitamin D, is greatly affected. Messages are carried from the brain to the skin and vice versa by neural networks and nutrients and information in the form of hormones are carried to and from the skin by the blood vessels. It is this hormonal influence which causes the skin to be affected during and after menopause. The dermis is the supportive layer of the skin made up of collagen, elastic fibers known as elastin and hair follicles. Without collagen and elastin the skin becomes wrinkled, poorly adherent to the body, and looses much of its resiliency. Research has shown that estrogen has a direct effect on the thickness and plenitude of both collagen and elastin and with the onset of menopause the amount of collagen decreases by as much as 2% per year. Furthermore, the elastic fibers begin to fragment and shred leaving cystic spaces in the dermal layer known as lacunae. Most of us recognize these changes as sagging, wrinkled skin. And because collagen and elastic fibers are a part of the supporting structure of the skin, these alterations weaken the skin making it more prone to injury. Dryness, fluctuation in skin temperature (ie: hot flashes) itchiness, bruising and hair loss are the common symptoms associated with menopause and skin changes. What may be partly responsible for these changes is the affect estrogen and progesterone have on the skin. Progesterone has been used for over 35 years as a skin moisturizer. 35 years it's been on the market as a skin moisturizer and not one complaint! One of the beneficial side effects that progesterone cream users often find that their skin becomes softer and more elastic, and as a result course wrinkles and lines become less apparent over time. Some women have reported success in this area using a little cream around the eyes and neck. The moisturizing effect is often reported to occur in even in areas where the cream is not applied indicating that the hydration effect is also taking place from within. Bioidentical Progesterone Cream reverses acceleration of the skin's aging process and helps to maintain a youthful appearance. Natural progesterone cream can also help dry skin and wrinkling on the face and brown spots on the hands and arms. Although the aging process cannot be stopped or reversed, there are many ways of slowing the changes which occur to the skin through aging and menopause. Avoiding the harmful rays of the sun and using sun protection can protect the skin. As we age, our skin cells grow slower and it takes longer to repair the damage. For menopausal and post menopausal women, the decline of estrogen also contributes to poor wound healing as there is less supporting collagen and elastin within the dermis. A good diet is also an important contributor to resilient skin. Foods rich in Vitamin E and C and selenium can reduce damage done to skin. Free radicals are dangerous chemicals which can sometimes cause genetic damage when they bump into cells. Vitamins C, E and selenium are nutrients referred to as antioxidants. These antioxidants circulate in the body and absorb dangerous free radicals like a sponge to water. But even if you stay out of the sun and eat right, chances are your skin will still need some fine-tuning during menopause. The skin becomes dry because of the decrease in estrogen level and hormonal changes, however, some people also find that they may suddenly break out a bit, especially around the chin area and mouth where more hormone receptors can be found. 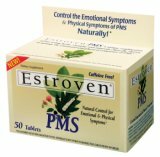 Estroven PMS formula is a fasting acting all natural herbal formula that manages the emotional and physical symptoms of PMS.